The pictures of Leon Trotsky that appear in the following pages were taken in Mexico in 1940 during the final months of his life. 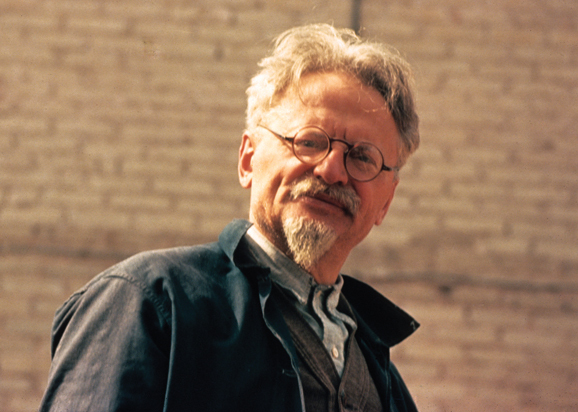 They are part of the remarkable collection of Trotsky photographs and motion pictures housed at the Hoover Archives. The photos shown here were taken by Alexander Buchman, an American who witnessed history on two continents. Buchman was born to an affluent family in Cleveland in 1911. He earned a degree in aeronautical engineering from the Case School of Applied Science in Cleveland in 1933. After graduation, he escaped the unemployment rolls by moving to Asia, spending most of the next six years in Shanghai, where he worked for various foreign news agencies. A camera enthusiast, he extensively photographed and filmed daily life in Shanghai, including the Japanese invasion and occupation of the city in 1937. As Buchman was leaving China in 1939, two Trotskyists he had gotten to know there arranged for him to visit Trotsky in Mexico to show the exiled revolutionary the nearly three hours of film he had taken in Shanghai (Buchman’s China film is also housed in the Hoover Archives). Buchman arrived at Trotsky’s home in Coyoacán, a suburb of Mexico City, in November 1939, carrying his Leica and an 8 mm Bell & Howell movie camera. As a member of Trotsky’s entourage, he took several hundred black-and-white and color photographs—the only color photos ever taken of Trotsky—and some fifty-five minutes of moving images. Alexander Buchman’s camera recorded scenes from several of Trotsky’s cactus-collecting expeditions in the winter of 1939–40. 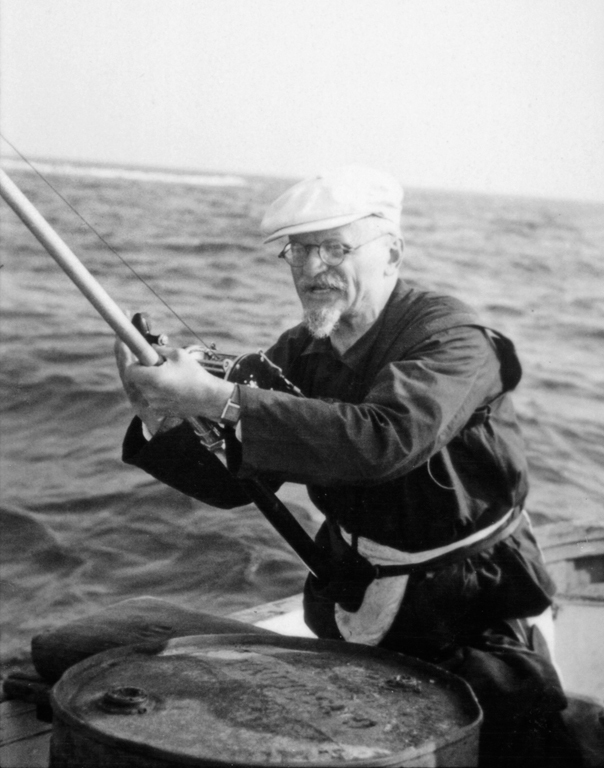 Trotsky, who believed in strenuous physical exercise, loved hunting and fishing, although life as an endangered exile restricted his opportunities. In Mexico, cactus hunting became, for a time, Trotsky’s chief form of exercise and something of an obsession. He put his whole staff to work. Some of the specimens he singled out for removal were heavy—the largest was nearly two hundred pounds—and armed with formidable spines. He and his fellow workers dug them up under the blazing sun, wrapped them in thick coats of newspaper, collected extra soil in sacks, and bundled their prizes into automobiles. The cactuses were then transplanted to the large patio of Trotsky’s fortresslike villa. Looking on, Trotsky’s wife, Natalia, joked about this punishing form of “penal labor.” Her husband said it was the next best thing to hunting. 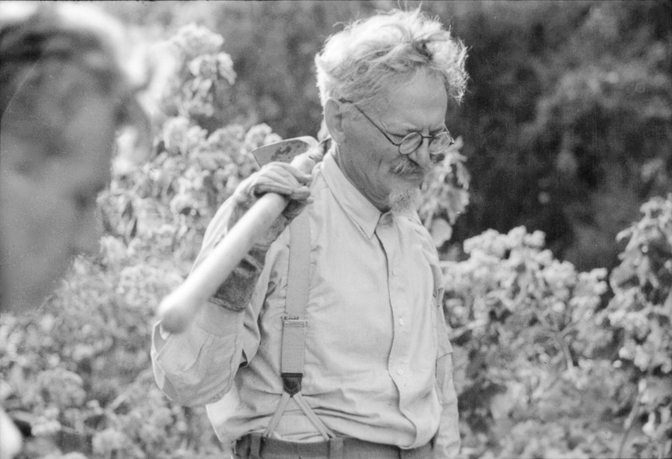 In Buchman’s photos and film, Trotsky, wearing heavy gloves and wielding a pickax, is seen digging out one and then another cactus, making it plain why the young American bodyguards were leery of these physically exhausting expeditions. Any hint of flagging energy might provoke a round of badgering from Trotsky, who at one point turns and accuses the cameraman of loafing. Buchman’s camera captured Trotsky feeding his rabbits, part of his daily routine and, as mounting concern for his security limited his excursions away from the house, his principal form of exercise. In January 1940, the burgeoning bunny population was transferred to new threedecker cages that Trotsky had designed. Buchman captured the moment when Trotsky gently delivered the docile creatures to their new quarters. When American socialist Max Eastman visited the house the following month, it seemed to him “so amusingly strange to be introduced to a flock of rabbits by the War Commissar and Commander-in-Chief of the Red Army.” By then, the rabbits numbered well over a hundred. 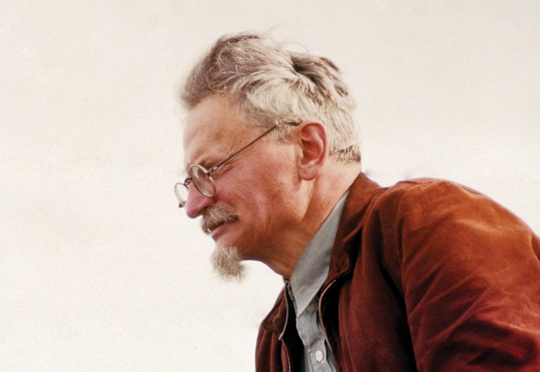 Toward the end of March 1940, Trotsky made a three-day visit to Veracruz harbor, two hundred miles from his home, and took advantage of the opportunity to go deep-sea fishing, the first such outing since he had arrived in Mexico in 1937. The experience seemed to revive his spirits—at least this is the clear impression conveyed by Buchman’s photographs and motion pictures of this excursion. Trotsky, manipulating reel and rod, appears vibrant. His famous white goatee juts forward; his round tortoiseshell glasses are speckled with sea spray. Not in years had he seemed so invigorated, according to his young comrades. By 1940, security was a vital concern for Trotsky, who anticipated that Stalin’s agents would try to assassinate him at his residence on Avenida Viena, where he had moved in May 1939. The house, a rundown villa built as a summer residence at the end of the nineteenth century, was relatively isolated, at the end of a dirt road lined with adobe hovels. The grounds were originally enclosed by brick-and-stone walls, but in the weeks before Trotsky moved in, the walls were raised to a minimum height of nearly fourteen feet (the tallest of them visible here in the background). Buchman helped rewire the intricate alarm system and for several months served as one of Trotsky’s guards. The expected attack came in the early morning hours of May 24, 1940, when twenty Mexican and Spanish communists, dressed in police and army uniforms and armed with machine guns and homemade bombs, stormed the house. Ducking into a corner of their bedroom to avoid the cross fire, Trotsky and his wife managed to escape unscathed. After the failed raid, the walls of the compound were made even taller and builders added a two-story bombproof redoubt and three brick turrets, each with loopholes overlooking the patio and the neighborhood. After these fortifications were completed, Trotsky likened his home to a medieval fortress. These and other preparations were undertaken in anticipation of another armed assault. Unbeknownst to Trotsky and his comrades, however, Stalin’s secret police, the NKVD, had assigned the task of eliminating Trotsky to a lone assassin. In this photo, Trotsky is wearing his favorite blue denim jacket, the same one he would be wearing when the murderer finally came. 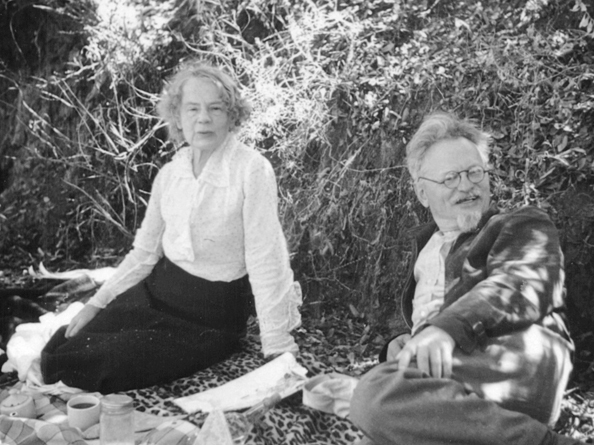 Trotsky and his wife, Natalia, loved to picnic in the Mexican countryside, always accompanied by several well-armed bodyguards. Trotsky was afflicted with high blood pressure and fatigue, and Natalia felt that he needed to take time to relax. By 1940, the couple’s family members and comrades in the Soviet Union had been swept away in the Great Terror; most were executed, imprisoned, or banished to the gulag. Their younger son, Sergei, arrested on the sensational charge of attempting the mass poisoning of factory workers, was presumed dead. Their older son, Lev, had died under mysterious circumstances in a Paris clinic in 1938, after an operation to remove his appendix. The grieving parents suspected the long arm of the NKVD. To the best of their knowledge, the only surviving family member was a grandson, Seva, who had joined them in Mexico in August 1939 for what proved to be the final year of Trotsky’s life. 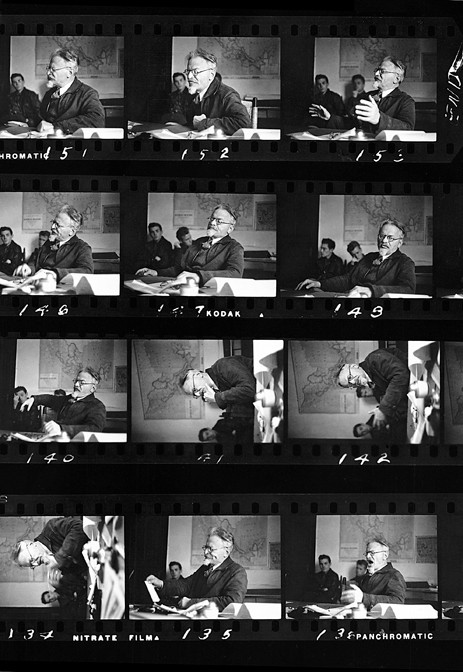 Buchman took many pictures of Trotsky seated at the desk in his study, the scene of daily political discussions he conducted among his secretaries and bodyguards. Trotsky was in his study in the late afternoon of August 20, 1940, in the company of Ramón Mercader, ostensibly a sympathetic businessman. Mercader was in fact a Spanish NKVD agent who had maneuvered to be alone with Trotsky on the pretext of seeking advice about an article he had written in support of Trotsky’s position on the world war. Concealed in Mercader’s raincoat was a pickax: one end was pointed, like an ice pick, the other was flat and wide; the handle, about a foot long, had been cut down for concealment. As Trotsky sat at his desk and began to read, Mercader pulled out his weapon and struck him on the head. Trotsky screamed and threw himself at his attacker, preventing a second blow as his bodyguards rushed to his rescue. In the end, the first blow proved fatal, and Trotsky died in a Mexico City hospital the following evening. Trotsky’s death at the hands of Stalin’s assassin sealed his status as a martyr in the eyes of his many sympathizers in the West. They tended to view the fallen revolutionary hero the way he had portrayed himself: as the genuine embodiment of the ideals of Leninism and the October Revolution, ideals allegedly perverted by Stalin and his totalitarian dictatorship. Over the years, the idealized image of Trotsky as the enlightened alternative to Stalin steadily faded. By the time the Soviet Union collapsed in 1991, few could imagine a happy outcome for the Soviet experiment under any Soviet ruler.